The Oil Desert Zone Boss starts with Sonic and Tails landing in a trash heap. 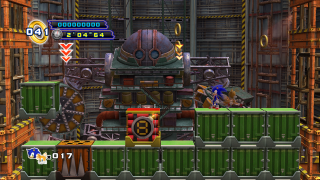 Dr. Eggman uses a magnet to collect the various pieces of junk and make a giant robot with them. The boss attacks with dropping crates onto the battle field. Dodge them to survive, and attack Eggman's cockpit with Tails flight to reach it. As the boss receives more hits, it will drop different crate types, including spike crates which shoot spikes like a spike trap, and exploding crates which blow up after a set amount of time. After enough hits, the boss suddenly leaves the trash chute, and Sonic and Tails fly out of the chute in chase. Outside, the boss begins to leap around Sonic and Tails. Every 4 jumps or so, it will jump directly onto the battlefield. Make sure when the boss leaps onto your area that it doesn't leap on you, and also make sure the boss is facing you. You need the boss facing this way to get the final hit. Do a Rolling Combo into its "toes" to finally bring the boss crashing down. This page was last edited on 24 September 2018, at 08:02.